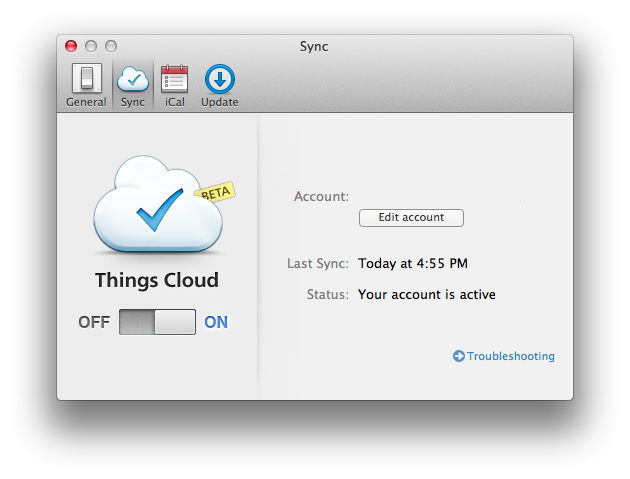 Originally announced last year, Things Cloud, a cloud syncing platform for Cultured Code's Things GTD app, is now available as public beta. Available on the Mac and iOS, Things is one of the most popular applications to manage todos and projects, and the app even won an Apple Design Award for its ease of use and simplicity. Cultured Code, however, has been heavily criticized by its user base over the years for the lack of a cloud syncing solution that would allow Things for iOS to stay up to date with Things for Mac; the criticism was also exacerbated by the fact that other GTD apps for the Mac and iOS, namely OmniFocus and Firetask, implemented working, reliable cloud databases in a relatively short period of time, whilst also adding new functionalities to their apps for paying customers. We’ve had incredible feedback from our users, telling us that Things Cloud is proving to be both fast and stable. Some of our users have adopted the beta entirely and created exceptionally large databases. In the coming weeks we are going to work out some kinks and performance bottlenecks related to such large databases. This is an important final step towards enabling the import of existing data. Once the import feature is ready, we’ll post another update. Whilst we'll leave our thoughts for a review once the software leaves beta, it's important to note that Cultured Code has always claimed its syncing solution would require more work (thus additional time to be implemented) because of a different technology being used to effortlessly push tasks and data across devices. For what it's worth, I have been able to test Things Cloud, and its sync process was indeed pretty fast both on WiFi and 3G. I'll save further considerations and tests for a proper review. To enable Things Cloud, you can head over Cultured Code's website and download the Mac beta. Cloud syncing can also be enabled by downloading the public version of Things for iOS, following the instructions provided on Cultured Code's website.